I think it’s black-letter, but I could be wrong. The reason I think this is they are comparing it the the 110, which is black-letter, and not the 120 red-letter. The are both the same text (Cambridge Cameo). If I can find out for sure I will post the info here. I heard back from LCBP – it is black-letter. I received the 115 Compact Bible from LCBP in Tan(Brown) this afternoon. The dimensions according to my tape measure are 7 5/8″X5 3/8″X1 1/2″ putting this into the same size group as the Cambridge Personal Concord. The type size is larger than the Cambridge (about 8 I think), well printed and easy to read, the center references are smaller, but also clear and easy to read. The Ironed Calfskin cover is soft, smooth and lovely, I’d prefer something with a bit more body but that is just my personal preference, my daughters will love it. There are no dictionaries or tables of measure, time or money, these would be nice to have, but are available in common reference books. The maps appear to be the previous generation Cambridge variety and are sufficient for anyone who is not a Geography nut like myself. 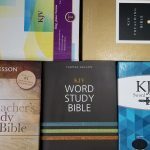 This is a very nice Bible, I’m sure my daughters will like it a lot, especially with the reference materials I’ve purchased to go along with the gift of the Bible. Oh yes, the Concordance is 151 plus pages in length sufficient for general study. 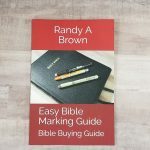 A very nice Bible available at a great price. Have purchased two of these bibles in black, one each on different dates. The most significant fault to be found is the moderate gutter cockling on both. 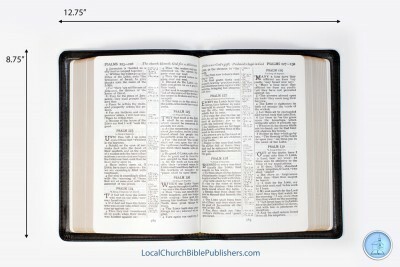 When you open the bible, there is a minute reluctance for the halves to roll due to the combined puckering of the pages. Also, as each page is turned in use, you will hear a slight “crinkle” sound because of the unbuckling of the page near the gutter as well as it being a visual annoyance. All of LCBP’s compact and hand size bible I have purchased exhibit this characteristic from modest to awful. And it does not work out with extended usage. This is my main complaint with their products. Other minor problems I have fixed which are also common occurrences at least in my experience. The one example of the #115 that is in regular use has shown that the rich black coloring on the leather is not color fast and must be super thin. This bible has only been used hand held and has not been slid on any surfaces. It is showing fading areas (mixed original and faded) and specks of very dark gray. The gold embossing on the spine is taking on a crazed effect (pattern of fine cracks) with the gold absent in the “cracks”. In effect, showing “old age” developing quite prematurely. On some of the outside stitching where the thread enters the holes, there is some reddish-brown coloring evident in those holes, I suppose from the underlying color of the leather? Both of these examples have a 5/13 manufacturing date. The gutter cockling is not so bad that I can not live with it, but wish this defect was not present or ever slightly so evident in their products as experienced. LCBP uses a paper that is around 50% thicker than what is found in Allan’s Clarendon. A major difference is that the #115 have very little ghosting. Evidently better than the much more expensive Allan. Overall the print quality is a little less than the Allan, but both leave something for improvement. The print density on the #115 varies from “dark” to “slightly less than dark”. Not something you will hardly notice, except in the few instances where the smaller font in the reference columns get a little weak. The vertical line borders of the reference columns are a little “wiggly” and not sharp and straight. The page size is 4.7” x 7”. The text block by itself to include the end pages is about 1.20″ thick (depending slightly on how much air is squeezed out!, measured with calipers). There is a slight sheen to the paper if angled in a certain direction to the light. However, as you would normally view a page, this is not evident. One thing of caution. As I was reclining and reading this bible, I rested my eyes for a few minutes. In doing so, placed my thumbs (clean) over the printed text as to not lose my place. When I resumed reading, noticed that the paper was lightly smudged where I had placed my thumbs. Although slight, it does stand out. My fault, as I normally keep fingers off any text. The maps are like my old Cambridge Concord except those in the #115 are of a little less resolution being primarily so in the text on the maps. Both ribbons are .25” wide, black, and 9.1” long, trimmed about 45 degrees on the ends. The ribbons come out straight from the spine without distortion and are not haphazardly angled. Do expect that you will have to sear the end of the ribbons to prevent fraying. There were no stuck together pages in this example from the gold gild. As with all of LCBP products?, they use the edge lined method of attaching the cover lining to the text block. Overall, I am very pleased with this bible. At its current price of $40 plus love offering, you would have to spend almost 4 times that amount to get a “better” hand sized bible of similar layout, and then the #115 would probably have the advantage in the ghosting category (don’t have a Cambridge Cameo to compare?). I would highly recommend this bible for any interested in the Cameo style of layout and size, its all black text, its overall general level of quality, and for its far comparatively inexpensive price. p.s. One very nice thing about this website is the numerous pictures that it exhibits of the printed text in the reviews. The “glamour” shots shown elsewhere are nice, but often lacking in showing much of the print. Only improvement, if I may suggest, would be more pictures of high resolution taken orthogonally to the page so one can resize it on their screen to get a better idea of the reading effect in consideration of a purchase. 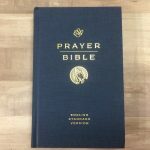 This site has been very helpful in evaluating that aspect of a bible if they had been reviewed here as well as the reader comments. Does anybody know if this Bible is small enough to tuck away on walks, hikes, et al? I like to walk along a path by a creek near my house and some other nice places. I’d like to be able to tuck a nice Bible like this away in a pocket or something uncomplicated, so I could stop at a good spot, enjoy my surroundings, and read The Word. I plan on spending a good amount of time doing this kind of thing this spring, summer, and fall. If you have purchased one of these or have seen one in person, please let me know what you think. It is greatly appreciated. This bible is roughly 5″X7″ and about 1″ thick, perhaps a little thinner. It would fit in a large coat pocket, a normal sized purse provided care is taken every time you put it in to the pocket or take it out so that the pages do not get rumpled or torn. A better solution for a hiker is a fanny pack that is worn around the waist. I know for a fact that some of these belted fanny packs have a large pouch and also feature a velcro snap-away storage area behind the pouch designed for concealed carry of a large pistol, this would be adequate for a bible of this size, perhaps even a larger one. Perhaps a better solution is to find a bible with a zippered closure. 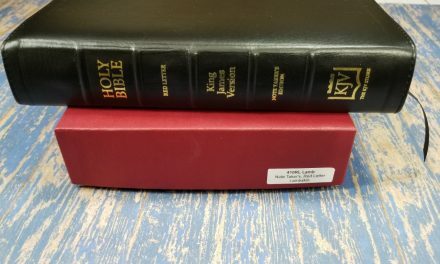 The Trinitarian Bible Society has at least 2, perhaps 3 different bibles with not only calfskin covers but with zippers complete with index detents for the books of the bible. One of these bibles is a very small Reduced Pitt Minion, I would not recommend it unless you have excellent eyesight although I can read the print with my 72 year old eyes in good light, they also offer a bible of the same general size of the LCBP 115 with a type font of about 8 points with a zipper closure, both of these bibles are available in calfskin at very reasonable prices. A good bookbinder or a shop that re-binds, repairs, and customizes bibles could also provide a zipper and index detents. If you haven’t already bought a bible for carry when you are hiking, you would be wise to consider a zippered cover. I hope my comments have been helpful to you. By the way, my daughters really like the LCBP 115 bibles I bought for them. I failed on my earlier post to tell you that The Trinitarian Bible Society (TBS) is linked on this blog. I really think a zippered cover is the solution to your need to carry a bible so you can read during hikes and other outdoor activities.